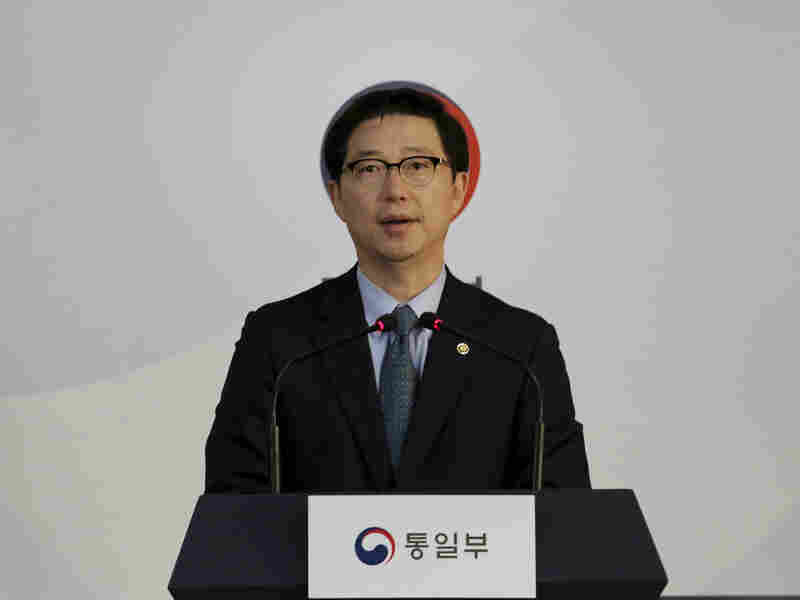 North Korea Quits South Korea Liaison Office; Trump Says No To Future Sanctions A source says the president was referring to future penalties, not those imposed Thursday against two Chinese companies for illicit support of North Korea in violation of international sanctions. 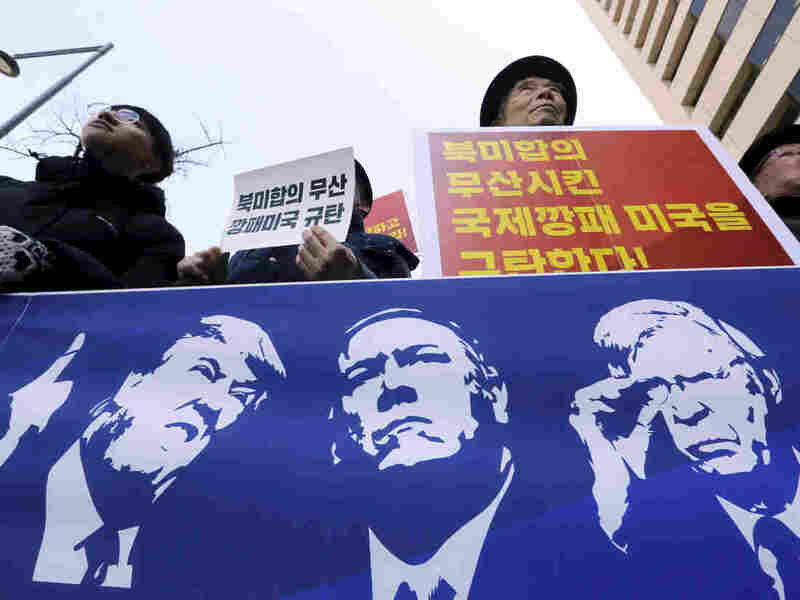 Protesters hold a banner showing images, of President Trump, Secretary of State Mike Pompeo, and National Security Adviser John Bolton during a rally against U.S. sanctions on North Korea, near the U.S. Embassy in Seoul, South Korea. "It was announced today by the U.S. Treasury that additional large scale Sanctions would be added to those already existing Sanctions on North Korea," Trump said on Twitter. "I have today ordered the withdrawal of those additional Sanctions!" Trump referred to future sanctions, according to a source familiar with the matter, not Thursday's actions against two Chinese firms. The Trump administration had moved to tighten sanctions on Pyongyang for its continued efforts to build nuclear weapons and ballistic missiles. The Treasury Department had slapped sanctions on the Chinese companies for illicitly shipping goods to and from North Korea, violating the current sanctions regime. In a followup to Trump's tweet, White House Press Secretary Sarah Sanders said the president "likes Chairman Kim and he doesn't think these sanctions will be necessary." Trump's announcement marks the latest development indicating that the president is intervening on issues traditionally handled by officials in the Treasury and State Departments. On Thursday, the president backtracked on decades of U.S. administration policy by backing Israel's claim to sovereignty over the Golan Heights, which has been under dispute with Syria since 1967. Trump's latest tweet came hours after North Korea withdrew staff from a liaison office with South Korea that is meant to strengthen the relationship between the two countries. It was a surprise move on Friday that appears to be the latest fallout from a disappointing summit earlier this month between President Trump and North Korean leader Kim Jong Un. South Korean Vice Unification Minister Chun Hae-sung speaks during a news conference at the Unification Ministry in Seoul, South Korea, on Friday after North Korea abruptly withdrew its staff from an inter-Korean liaison office in the North.